4K 25fps (interpolation) and 1080P 60fps dynamic shooting, making the moving image more smooth and wonderful. With the wearable remote watch, you really look cool and different. Combining the function of time lapse and continuous lapse, you can get a series of amazing photos. Enjoy more fun with multiple mounting accessories. 4K 25fps(interpolated) and 1080P 60fps dynamic shooting, shoot smoother and clearer. 12MP sensor, with 170°wide-angle lens, capture more wonderful views! Support "Burst Photo"/ Time Lapse/ Continuous Lapse/ Single Shot. Built-in WiFi, support real-time sharing via smartphone. Wearable remote watch enable you to shoot from away, effective distance 10m. 2.0" LCD screen for convenient operation and instant playback. 30 meters waterproof depth with case, perfect for all kinds of underwater adventures. Multiple mounting accessories like chest wear/head wear/bicycle mount help to enjoy more fun with camera. Comes with a shockproof & dust-proof & portable carrying case. 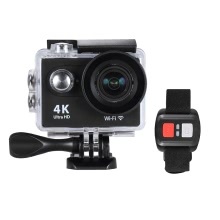 Ideal for recording extreme activities such as surfing/climbing/hiking/flying/diving/bicycling and etc. Item Size: 6 * 4 * 2.5cm / 2.4 * 1.6 * 1.0"
Package Size: 20.5 * 15.5 * 6.5cm / 8.1 * 6.1 * 2.6"
The storage card is not included and class 10 and above is high recommended. Under 4K & 2.7K recording mode, the looping video and APP control function are not available.